capital Kohima. 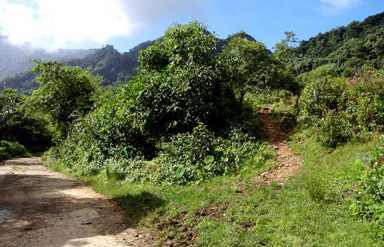 The village got its name from ‘Khwuno’, a small plant that is found in abundance around the village. 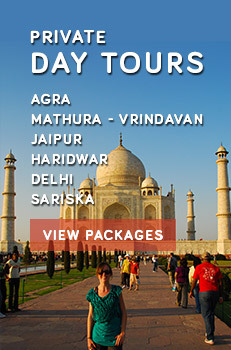 Tourists can have the captivating glimpses of the majestic mountains, beautiful waterfalls and dense forests. 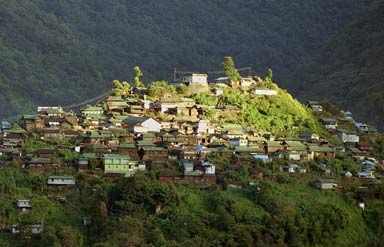 Nestled among green hills, the village is famous for its conversational ventures and was awarded with the title of the first green village of the country. The village also boasts of a pool of master craftsmen, who are proficient in the art of weaving with bamboo and cane. Equilibrium and discipline are apparent in the placement of a village gate, the accurate manner in which the terrace cultivation is done. Despite the old world feel, the village has a good connectivity with the outside world with modern communication facilities. Tourists visiting Khonoma can visit its paddy terraces where 20 types of rice are grown. 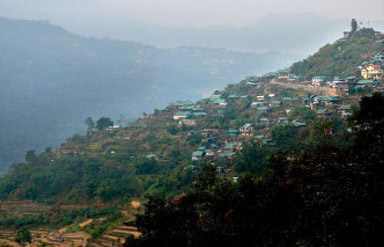 Khonoma also stands apart amongst all Naga villages because of the legends of brave deeds, associated with it. Being an integrated part of the Naga culture, Khonoma is known for its past heritage of fighting and warfare. With the onset of the missionaries, the head hunting became obsolete. In recent times, the protection of wildlife is of prime importance, which has been done by the village council of Khonoma. The village has even set a good example by preserving a large part of its community forests. Khonoma Tourism Development Board also conducts several workshops to spread the awareness on environment conservation. Every year, thousands of tourists flock this small village to experience the nature.